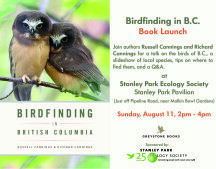 Join Richard and Russell Cannings on Sunday, August 11 from 2-4 pm at SPES’ office at the Stanley Park Pavilion (2nd floor) for a talk about the birds of BC, a slideshow with stunning images, tips on where to find birds and a Q&A. The event is free and there’s no need to register in advance. 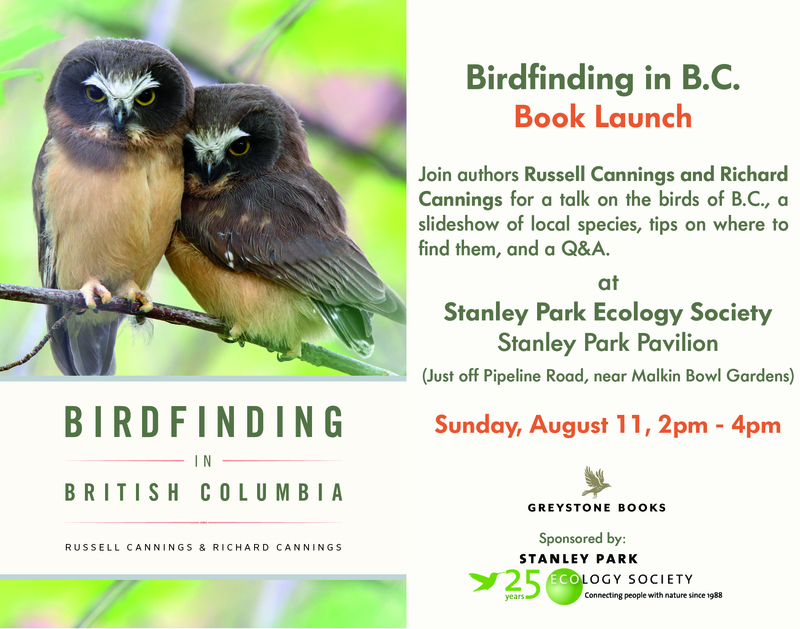 Veteran naturalist and birdfinder Richard Cannings and his son, Russell Cannings, a gifted birder in his own right, are out with a new book called Birdfinding in BC. In this book, they use their combined knowledge to guide readers to the best birding sites in the province. Packed with descriptions of the natural history, ecosystems, and diverse landscapes of British Columbia and accompanied by numerous maps, this thorough guide is enhanced by Donald Gunn”s charming line drawings and the authors” infectious~enthusiasm, making it a must-have for novice and expert birders alike. SPES and Greystone books are co-hosting a book launch for this book on August 11 from 2-4 pm at the second floor of the Stanley Park Dining Pavilion.